The Holiday Villas Hotel in Subang Jaya has been our regular place to stay in suburban Kuala Lumpur for many years. The hotel’s real attraction is it’s 8 lane 50m sized Olympic swimming pool which is situated outside and looks across to the tree lined grounds of an adjacent lake. This green open space has yet to be encroached upon by surrounding highrised development as the lake is big and is part of a network of suburban waterways that captures and attenuates tropical storm water. On the lake’s far side is a small restaurant and beyond that, in the bright green foliage, is the railway line to Port Klang and behind that the Federal Highway – the first motorway to be built in Malaysia. The lake, along with others nearby, are vestiges of the Klang Valley tin mining boom of the early 20th century upon which Kuala Lumpur was founded. They are the remnant excavations which have become water filled and over time incorporated into the city’s infrastructure. Typically these water bodies were never built upon as they were perceived to be both unstable and polluted from the tin mining. The lakes are a verdant asset providing scarce open space that everyone can share from the surrounding suburbs. People come to fish and walk around their perimeters and come from some distances to exercise before the start of the working day. The train rumbles in the background and the road traffic roars from the highway but still the lakes and their green surrounds hold their own calm and tranquility against the barrage of noise and air pollutions. A massive new electrical substation has had to be built on the other side of the highway to serve the new residential towers that are continuing to be built. The new pylons and high voltage cabling festoons the skies above and around the lakesides as they travel away into expanding Kuala Lumpur. Somehow the space of the lake still wins with the railway and highway to protect the views from the hotel’s swimming pool from further development. We swim at least once everyday when we stay at the hotel and it has to be the best swimming pool I’ve swam in. It’s a proper length and most of the time is almost empty except on weekends when there are lots of swimming classes and the pool is divided up to cater for the differing ages and levels of swimmers. It is clean, not heavily chlorinated and is outside with fresh air, sunshine and the coolness of the early mornings and the heat of the middays. There are adjacent kidney shaped ‘play’ pools and a massive jacuzzi shaded beneath trees, all framing the view towards the old tin mining lake and greenery beyond. When I first began to swim at Holiday Villas I could barely get from one end of the pool to the other with out having to stop to gasp for air. I could never understand how other much older and more sedate swimmers could swim up and down it’s length with so much apparent ease. On my returns to London I continued to swim, trying to keep some of my holiday fitness and discovered through Yasmin and Madeline, my Alexander Technique teacher, the Shaw Method of swimming. This is a way of swimming using Alexander principles as developed by Stephen Shaw. Yasmin had completed two swimming courses previously run by him, which she’d told me much about, and I borrowed his DVD from Madeline and proceeded to try and re-teach myself to swim. This involved much awkwardness marching in swimming pools, practicing arm strokes and almost drowning as I tried to apply the principles of ‘gliding’ as opposed to my usual thrashing about in the water. 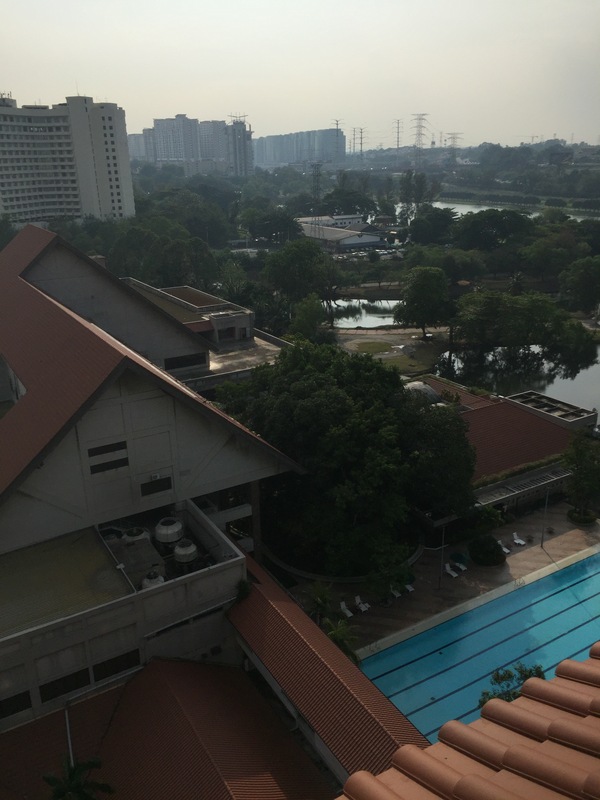 After much time, and I mean years of swimming practice with return trips to Malaysia for intensive use of the large hotel swimming pool, I began to swim better. I’m not particularly fast but can now with some ease swim from end to end of the pool. The big changes in my swimming technique are that I can now breath to both sides as I swim front crawl and can alternate to either left or right whenever I like with out drinking in most of the water. With my breast stroke I can now combine the principle of the ‘glide’ with the separation of arm strokes and leg kicks to move efficiently through the water. At times swimming now feels almost beautiful as my mind empties of everything and I concentrate only on my breathing action, economy of movement, being quiet and making no splash. In the mornings at Holiday Villas the water in the swimming pool is still and calm and momentarily I can feel as if my swimming is becoming perfect. I struggle to remember the numbers of lengths as I touch to swim back the way I’ve just come, catching glimpses of the lake as I turn with the trees, blue sky and slanting sunshine above, and the day and space of the water opening up before me. No I didn’t! Life seems full of these circles.